In recognition of her significant contributions and accomplishments in the field of biology and ecology of harmful microalgae, specifically her pioneering studies on toxic dinoflagellate species responsible for Paralytic Shellfish Poisoning in the Philippines. Her original study in culturing the dinoflagellate Pyrodinium bahamanse var. compressum, the main Paralytic Shellfish Poisoning causative organism in the Philippines and in Southeast Asia, has paved the way in opening opportunities for further studies on the biology and eco-physiology of the dinoflagellate. Such studies have led to the identification of the factors that affect the occurence of algal blooms and have contributed to the design and implementation of proactive strategies that can mitigate the harmful effects of red tides and other algal blooms. Thus, negative socio-economic impacts specially on the coastal people have been minimized, if not prevented. Her major studies on the reproductive biology of carrageenan-producing seaweed species have proven that reproductive structures can be released and kept in the laboratory and become sources of seedlings/sporelings for culture- a mechanism being tried and developed to make the system useful to farming at commercial scales. 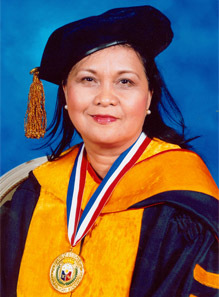 2005 - Gregorio Y. Zara Award - Philippine Association for the Adcancement of Science, Inc.